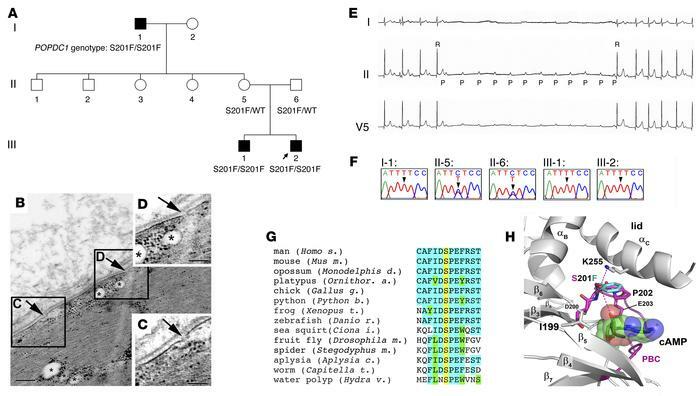 Identification of the POPDC1S201F mutation associated with AV block and LGMD. (A) Pedigree of a family homozygous for the POPDC1S201F mutation. The index patient (PTIII-2) and his brother (PTIII-1) suffered from AV block and the grandfather (PTI-1) from LGMD and AV block. (B) TEM analysis of skeletal muscle of PTI-1 revealed the presence of plasma membrane discontinuities (arrows) and subsarcolemmal and intermyofibrillar vacuoles (asterisks). C and D show higher magnifications of the boxed areas in B. Scale bars: 2 μm (B); 1 μm (C and D). Data depicted are representative of results derived from a single biopsy. (E) Holter ECG of the index patient (PTIII-2) displaying an episode of a paroxysmal AV block. (F) Electropherogram of the Sanger sequencing of genomic DNA isolated from family members. (G) Sequence alignment of part of the Popeye domain demonstrating sequence conservation. Many residues are identical (turquoise) or similar (green); however, S201 (yellow) is ultraconserved. (H) 3D model of the Popeye domain. Only the phosphate-binding cassette (PBC) is shown. Two hydrogen bonds are formed by S201, but these are lost when the F201 (turquoise) mutant residue is present, possibly affecting the ligand-binding affinity of the Popeye domain.